Been a while since I posted, been a while since I built anything too :-( . Anyway, my question is this. I have a plastic storage bin that stand about 4 foot tall with several drawers, I use this to store 95% of my model stuff. Paint, sand papaers, gadgets, everything.. I recently redid my office and am going to be moving my modeling area there. But I don't want to put the plastic cart in there because it's too high, and simply will look out of place. 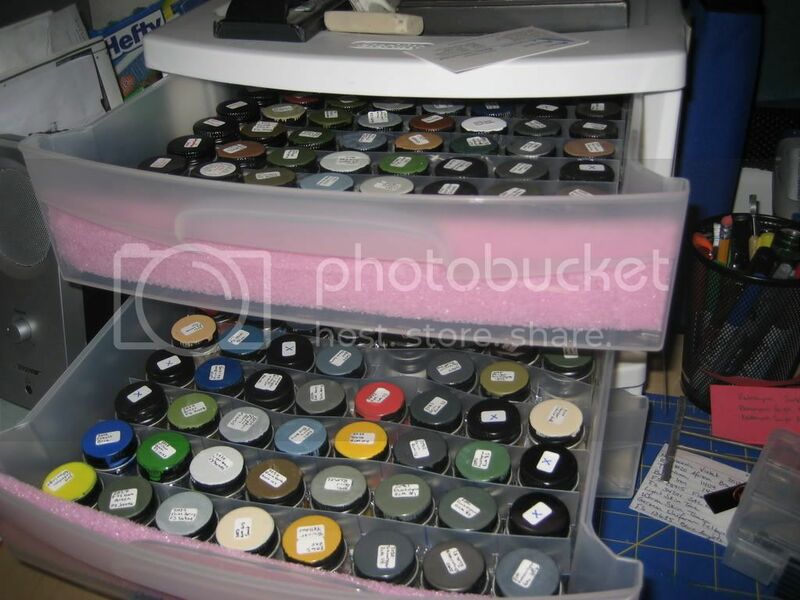 I was wondering if anyone had a good idea for storing paint bottles. I have a lot of the wider Tamiya bottles as well as the smaller Testors bottles, so i would want something that could accomidate both. I was thinking something like a spice rack but it would have to be pretty big. Please put photos up if you have any available. Thanks!!! You might try the Pantier! That's an old pic, it's almost full now. I use only Tamiya and only the 10ml bottles are available. That rack can hold 175 of the small bottles! Thank's Bgrigg, I like the carousel idea, but the stairway to paint is nice also, Ill have to look into the pantier. Thanks! The ends are capped. I have three supports, one on either end, and one in the center. This is an updated pic. It now resides in an area I keep solely for painting. Although I have an airbrush I find I still do quite a bit of brush painting. Here's a look at my build table. You can see the Wall of Shame where I keep my unfinished builds. I'm planning on adding more shelves so I can keep more unfinished kits! And yes I cleaned up! I do everytime I stop building for the day. The only reason there is a partially built kit on the paint station is I am working on the interior of a 66 GTO. Here's the shelf I builtusing pre-cut 1/4 x 1 1/2 x 4 wood from home depot. The back is a piece of 1/8" luann (sp?) plywood. All glues up with CA and took about 1/2 hour to do. The last pic is for the more "realistic" view since I don't recall the bench really ever looking like the 1st one. I have a lot of the wider Tamiya bottles as well as the smaller Testors bottles, so i would want something that could accomidate both. If you have the 23ml bottles of Tamiya paint, they won't fit onto the Pantier. The 10ml bottles and Testors bottles fit fine though. Green side out, brown side out. Run in circles, scream and shout. I like the shelf style, I think I might just have to make one, just dont know how it would look sitting on my table top, but guess ill find out. Thanks for the reply's guys they are a big help! Hey! Who let you in my workroom?? Get out! Just kidding, but man do great minds think alike, or what? One of these babies costs about $5 at Walmart and will hold the ENTIRE Model Master line, plus a bunch of random paints, brushes, and masking materials in the bottom drawer. Plus, my girlfriend went and bought a few flexible cutting boards for another $5 and made dividers out of them so that the paints don't slide around. Never trust anyone who refuses to drink domestic beer, laugh at the Three Stooges, or crank Back In Black. Get out of my head Cardshark! I just found this expandable space shelf at a local store for $9.99. 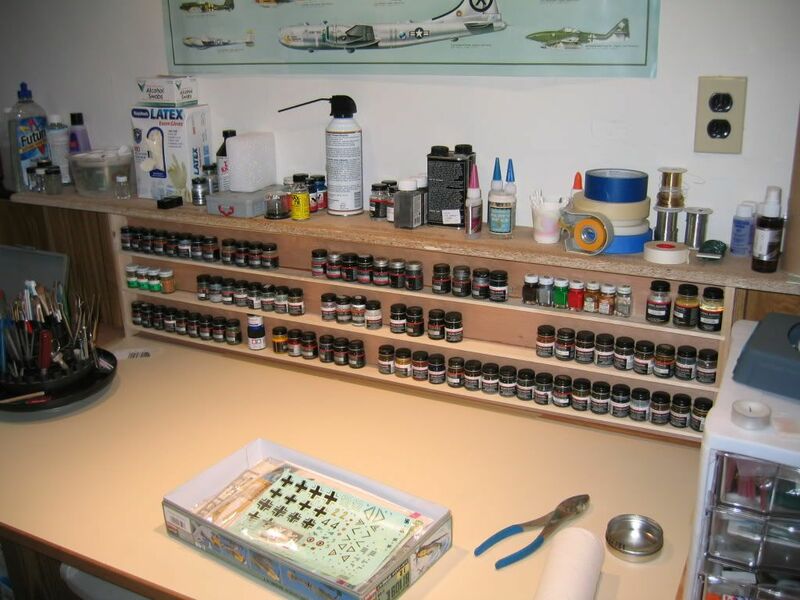 Paint bottle storage has always been an issue for most modelers at some point and time. If you have little hands around they need to be out of reach yet handy. Storing them so the labels are clearly visible is nice, but has draw backs as well. Anything on the bench exposed to the paint overspray, sanding dust or just the particles in the air and sunlight (unless you live in a mancave) hold dirt and debris (and sunlight can affect paints shelf life). 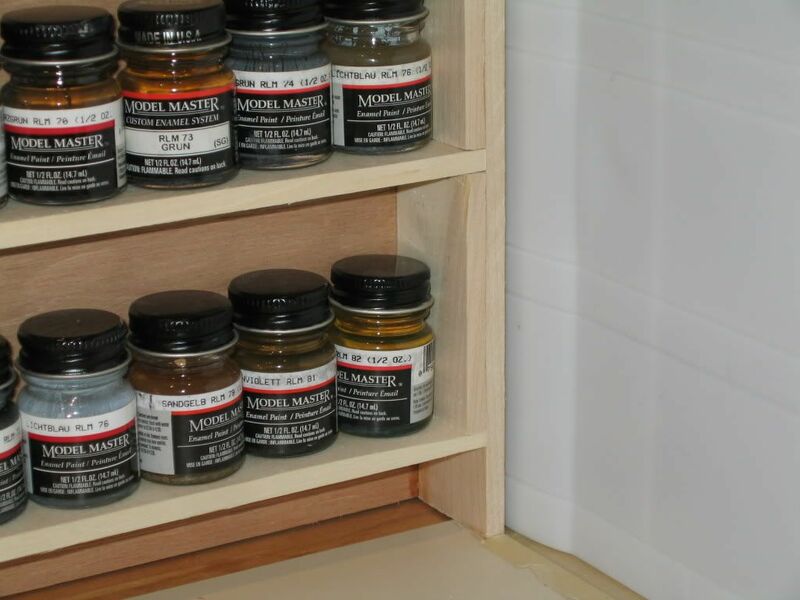 Therefore I opt for a drawer(s) to store my paint. 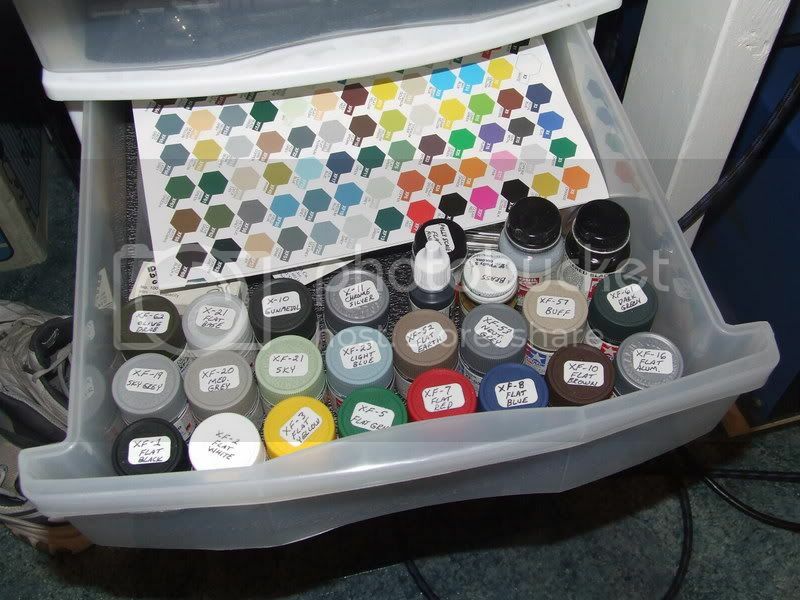 Yes, it does add the necessity in some cases to add little labels to the lid for easier locating when you need a specific color, but usually I paint a blotch on the lid and use a marker to indicate the paints color or number. The less on the bench the better. I don't know how many times I inadvertantly opened a dusty bottle adjacent to my 'wet' project to have a dust bug or dried paint chunk fall onto the wet surface. Exposed paint bottles/tins/jars are a pain to wipe down on a regular bases. Given the increasing costs of paint I'm making it a point to better treat them. Wiping down the lid and thread before closing for one! 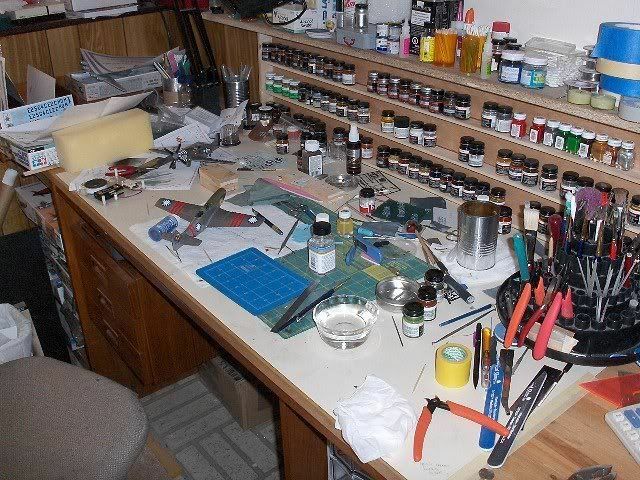 "Its not the workbench that makes the model, it is the modeler at the workbench." I just picked up the paintier from micromark.com because I liked the idea of the smaller footprint. But, the normal size (23ml) Tamiya paints don't fit unless you tilt them on their side. Which is ok, because I tilt it so the cap is pointing towards me, so i know what color I'm looking for. The 10ml tamiya, Model Master and PollyScale all fit perfectly. But be aware with the paintier; this thing's like a garage kit made with PVC pipe. The cut edges are all rough and there's PVC dust everywhere. The holes for the paintbrushes are roughly drilled, there's PVC danglies on every hole. Plus, the paintbrushes are not secure. The tray under the top tray just has a trough where the paint brush end sits in. Andsince they're not secure, they just slide all around. I could forgive the rough build and poor paintbrush holder design if only they had molded it to hold the 23ml Tamiya paints. It's not like they're some obscure, never used paint, for cryin' out loud.